Lately Toyota has been plagued with recalls of their vehicles. Fed up with this bad turn of events, the President issued an urgent ultimatum to his R&D Team to come up immediately with a fool-proof hybrid prototype that will not cause any more problem. True to Japanese ingenuity, the perfect vehicle was unveiled recently. 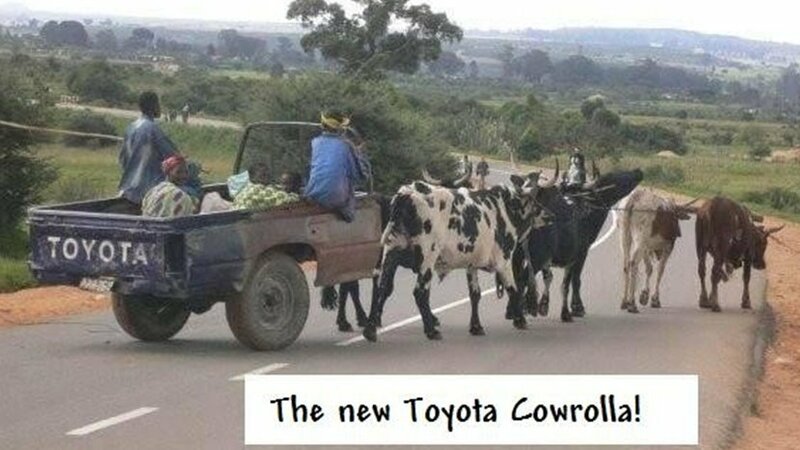 Cowrolla ,Toyota MooMoo capacity 6 hi-breed grass - cowspower double overhead twin horn cam and string power steering model . Available now for order; choice of colour; no deposit required. Just bring your own cows. You got to be fast to get it. It's selling like hot cows!! 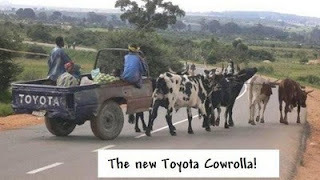 Toyota management is unsure whether its corporate name should change to "Recal-Yota" or " Cow-yota" , it is seeking the public input for the new corporate name and you can cast your vote in the company web site, then your name will be entered for a sweepstakes with the top prize of a brand new "cowrolla" 2011 modal with 150 natural cow power (CP). Justin! Please encourage your readers to visit the new Toyota company website and cast their votes ;Toyota management want to get it right this time and guarantee no more recall in the future.